Dress: Asos (loving this & this one, too) Shoes: Guess Handbag: Michael Kors, Earrings: Lia Sophia (gifted), Watch: Michael Kors, Cuff Bracelet: c/o Belina Jewelry, Lips: MAC Plum Liner + Laura Mercier in Violet. Simple date nights are the best. We dined at one of our favorite restaurants downtown, Sobys, and came home afterwards to light a few candles, curl up in cozy blankets and watch an old movie. A perfect night to celebrate and toast to our 3 year anniversary! Love this outfit! Congratulations on your anniversary! Beautiful dress and those t-strap shoes are perfect. Glad you enjoyed a romantic evening with your hubs! Such a classy look. You look stunning! Happy aniversary lovely!!! you look so stunning !! Great outfit! And Happy Anniversary. This is such a great outfit! Your hair looks so pretty! You look so cute! Love the dress. That dress is fabulous! I can't get enough of poet sleeves! You look absolutely gorgeous in this color blue....very elegant and beautiful. I love the tie around the neck! It's so pretty and retro. Definitely a special touch for date night! I am loving the outfit and i LOVE your headband braid! You are so pretty! And your style ist so amazing ! Happy anniversary! You looked beautiful. I am in love with this dress, it's so gorgeous!! Sounds like a perfect date night to me!! You look lovely as well! I'm in love with that dress!! Gorgeous. Sounds like y'all had a lovely date! I love this color and the style of the dress, it is such a great date night dress! Happy anniversary! Happy Anniversary!! Love your outfit choice! Congrats! Lovely outfit for a date! Congrats Meg! and you look beautiful! P.S. I'm hosting a monogrammed ring giveaway on my blog, so make sure you stop by and check it out! Love the outfit and your hair. Congrats and glad you two were able to enjoy a nice night together. 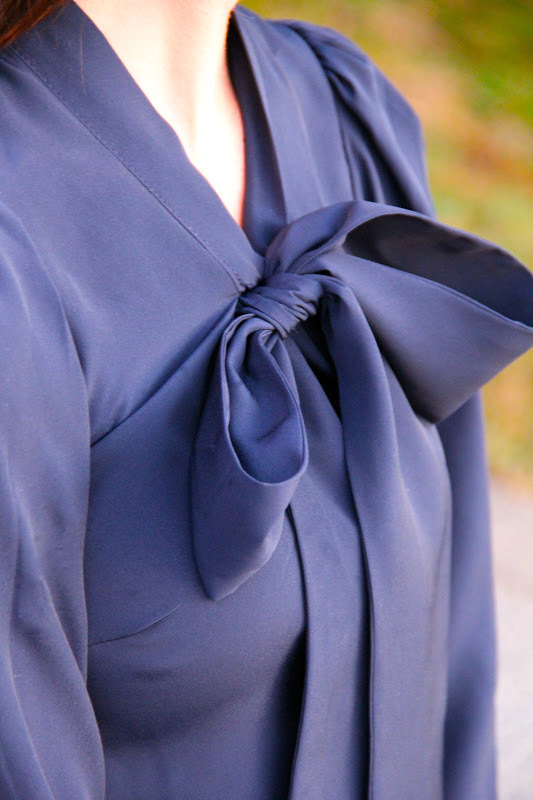 I love the bow detail!!! Love the bow! Sounds like a great anniversary! Um, I'm speechless...you are GORGEOUS!! :) in love with your style lady, you've got it for sure! Thanks for stopping by my blog and leaving a bit of comment love! Can't wait to see what you pull out of your closet next! Happy Anniversary! Such a classy dress and I love your heels! I agree w/you, I love date nights! You look gorgeous. Happy belated anniversary. Sounds like it was a perfectly quiet/romantic evening. You look gorgeous! I especially love how you did your hair! Did you just do a plait and then wrap it around? Love it.